So fancying a trip to Darjeeling? You must be lured by the dazzling snow peaks of Kanchenjunga overlooking the hill town? And the beautiful tea gardens on the slopes of rolling hills, the orchids, pines & rhododendrons, the cute Himalayan toy train whistling its way through the mountains? And you want to combine all that with great sightseeing tours, food, shopping and other exciting activities. Right? Yes, it's all possible in Darjeeling, a gem of a place known for its youthful vibe combined with modern as well as colonial charm. Excited? But perfectly planning & designing a tour here in the hills is tricky. I have been exploring Darjeeling for decades, initially as a vacationer and then as a travel writer. Over time I have looked into many aspects of Darjeeling at great depths and can perhaps claim that I know almost every nook & corner of the hills and a lot about its life, people & culture. This website is all about sharing those findings and experiences so that you can yourself easily design a great vacation in Darjeeling hills & Sikkim, and book hotels, sightseeing tours & activities. It not only helps cutting out unnecessary costs, you can shape it exactly the way you want. Just to give you a head start about the place, Darjeeling hill town is located at an altitude of 6,710ft in north east India and is part of the state of West Bengal. The nearest airport is Bagdogra and the nearest major railway junction is New Jalpaiguri (NJP). It takes about 3 hours to reach Darjeeling from both these locations by car. Private taxis (available at NJP and Bagdogra), shared taxis (available at NJP) and bus (available at Siliguri bus stand which is 8kms from NJP) are the main public transports to get to Darjeeling from NJP station or Bagdogra airport. Alternatively, you can take the fascinating toy train ride from NJP or Siliguri all the way up to Darjeeling soaking in the scenic sights of Himalayas in a 7-hour lazy journey. Read: How to reach Darjeeling to get details including transports, routes and fares for Darjeeling. NOTE: Only private taxis are available at Bagdogra airport, but no shared taxis (unless you book online), bus service or toy train. Unlike in Gangtok, there is no helicopter service from Bagdogra to Darjeeling. You need to go by road and negotiate steep & winding mountain roads. Although the area of Darjeeling hill town itself is small (about 10 square kilometers), Darjeeling is also a district and spans over a large area of about 2,100 square kilometers. 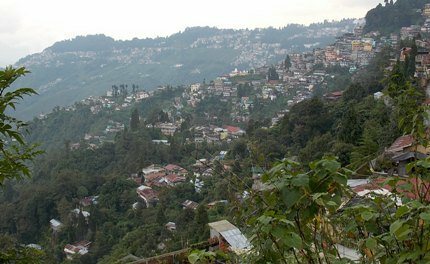 The district has subdivisions like Kurseong, Siliguri etc as well as the hill resort town of Mirik. So there are many lovely places to visit within Darjeeling hills itself. Update February 2017: Kalimpong which was earlier a subdivision of Darjeeling district has become a separate district of West Bengal effective 14th Feb 2017 with an area of 1,056 square kilometers of its own. It is no longer a subdivision of Darjeeling district. 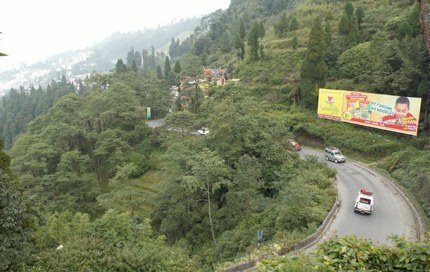 Within Darjeeling town area, you can walk to visit several tourist attractions. Plenty of taxis (which are private commercial vehicles of various types - small & large) are available at the stands. They offer both local sightseeing tours as well as point-to-point transfers. You can also get shared taxis (mainly Jeep type vehicles) at the stands, but they are mostly available for transfers and sometimes for tours. Presently around 6,00,000 Indian tourists and 30,000 foreign nationals visit Darjeeling annually. Gangtok (the Capital of Sikkim) which is only 4-hour drive from Darjeeling along with several other great destinations in Sikkim offer great opportunity to easily combine with Darjeeling visit. You will see numerous sprawling tea estates in Darjeeling that produce world's best tea, as well as the amazing narrow gauge Toy Train - an engineering marvel of 1880s which could overcome the steep gradients and curves of the mountains and provided a scenic railway transportation in the hills. 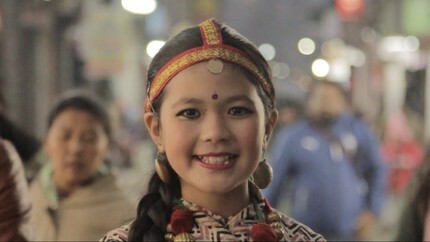 Residents are mostly immigrant Nepalese (predominantly Gorkhas), Tibetans, as well as some Lepchas and Bhutias from Sikkim. Nepalese are mostly Hindus while Tibetans follow Buddhism. When you compare them with the people of lower plains, they are quite different both in looks and culture. It's an amazing world out there. But they are warm and tourist friendly. Over the past few decades Darjeeling lacked proper developmental support and had seen random and thoughtless constructions & overcrowding which it hardly deserved. Despite that the charming, sincere and friendly people of the place have continued to strive hard and successfully preserved pride of 'Queen of the Hills' as one of the best places for tourism even today. The town center of Darjeeling is known as Mall or Chowrasta, which is a flat open public square, a pedestrian only zone free of vehicular traffic and surrounded by colorful stores with backdrop of mountains and valleys. Mall or Chowrasta is the main town center. Most tourists try to stay near the Mall area to be close to hub of all activities, restaurants and shops. So due to high demand, numerous hotels of all types have mushroomed near the Mall area. Alternatively you can stay a bit away, enjoy nature & views, and a location relatively free of crowd. 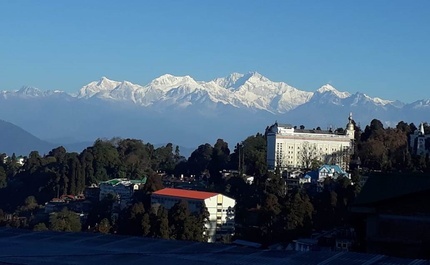 During spring, summer and autumn, the weather in Darjeeling is pleasantly cool and perfect for city dwellers who flock in volumes during such time. Many come to enjoy the rains in monsoon and chill in the winter as well. And when such visits are combined with wonderful views of snow peaks and valleys, tea gardens, forests & flowering plantations, amazing sightseeing tours & activities, great food & stays, and all at affordable prices .... won't you love a vacation like that? There is much more to Darjeeling than just a few days of fun and frolic. Won't you like to know why the name Darjeeling in the first place? It's location & terrain, about its rich colonial history, how a land that once had only 10 people living in it became a world known tourist destination? on Darjeeling Tourism Card. She was then 4-years old. And what about the people of the area, where did they come from, their religion, culture and language? How about the flora and fauna in the region? A little knowledge of all this will add a special flavor to your visit to this wonderland. Visit Darjeeling Insights to know about them all. And, in order to facilitate self designed and budget friendly vacation, I have brought together many small & large hotels, restaurants, shops, tour & adventure operators and even transporters who are among the best. And they all offer great discounts if you have a Darjeeling Tourism Card which you can get at a nominal price. So apart from shaping your own vacation, you & your family can now avail great discounts almost at every step when you use the card. Now the treasures of Darjeeling hills... Visit the links for details. There are countless tourist places here including great viewpoints offering magnificent views of Kanchenjunga snow peaks, Buddhist monasteries, historical churches, temples, rolling tea estates on mountain slopes, museums, art galleries, parks & gardens, waterfalls, cable car ride offering you stunning views of the mountain landscapes and tea gardens below, and more. You will need to take a private or a shared vehicle or in some cases a walking tour to visit some of the great tourist places I mentioned above. While most tourists go for the 3-Point, 7-point or Mixed-Point sightseeing tours offered by the local taxi drivers and tour operators, there are some great tours and hikes like heritage tours, tea garden walks, village tours and others that are hardly known to tourists. Day trips to places like Mirik, Kalimpong and even Lamahatta and Mongpu will keep you engrossed in marvelous scenic views & sights. You can even make a Jeep safari to Singalila (high altitude national park) and beyond to Sandakphu, a place known for offering one of the best views of four of the world's highest five peaks, all in one stretch of snow. You will find them all in the link above. I have tried out many hotels and lodgings over the years to get different flavors of our stays. You will get all sorts of accommodations in Darjeeling including budget, mid priced and even luxury hotels & resorts. This guide will first tell you about the overall hotels scenario in Darjeeling, what to and not to expect, and then take you through a list of accommodations on different categories. You will find links that will provide detailed reviews and insights into the hotels along with pictures. When it comes to food, Darjeeling can offer great many options. Starting from Thai and Tibetan cuisine, to Indian, Chinese, Continental and Nepali dishes. There are real good food for all. Some of my favorites include the Nepali thali, Tibetan wanton soup also known as momos in soup, and a Naga dish that is prepared with dried bamboo shoots with meat. While there are food of all types, there are also wide price ranges that would suit all. In fact, there are some tin shack eateries that are really great and offer excellent food at very affordable prices. They have remained favorites to many returning tourists. Starting from handmade crafts & jewelry to many different types of curios, woolen clothes, jackets and kashminas, Darjeeling can be a shoppers paradise. There are some shops that are known for collections of some of the greatest pictures of Darjeeling's life and landscapes. And what about taking back home the "Champaign of Tea" from the place where it is produced? During the peak season, most of the shops in Darjeeling remain open until 8pm. The fun and entertainment in this mesmerizing hill town can continue through the evening if you have the will to pursue. There are some great pubs and bars in Darjeeling where many locals and tourists gather in the late evenings. Some of the pub owners are now my great friends. The Toy Train as it is fondly called, has been the romantic heart of Darjeeling that has touched everybody who has been to this hill paradise. It was introduced in 1881 by the British connecting Siliguri with Darjeeling with a narrow gauge line. It helped cut down the enormous time it took to transport passengers by bullock cart and horse carriages along the Hill Cart Road. It also allowed the less affluent Europeans living at the lower plains to visit the health resort. If you love to trek and enjoy the nature, don't miss out on one of the many unbelievable treks in Darjeeling hills. There are routes offering stunning views of the mountains, forests and wildlife. There can be light treks over few days with 4-5 hours of walk a day that even casual walkers can undertake, or heavier treks for several days over mountain landscapes that offer fabulous experience. Where else in the world can you get a vista of four out of five highest peaks of the world in one stretch of snow, or get to see exotic rare animals like Red Panda, or view flowering plants like rhododendrons, magnolia, carpets of primula and over 600 varieties of orchids? I have been to such fascinating treks and shared my experience in the link above. When should you visit Darjeeling? Depends on what and how you want to enjoy. Most visitors target the view of Kanchenjunga in a temperate weather. Many others like to feel the winter in the hills and the occasional snow. Others love even the monsoon and play of the mist. And there are some who just want to experience the mountains and villages when there are no tourists, when Darjeeling is at its serene best. This section will guide you through the weather conditions in Darjeeling in different seasons, and let you know what can you expect and what you can't. If you plan to explore Darjeeling and want to know where is what, you need a good map. Unfortunately there aren't many good maps of Darjeeling available, because in mountainous terrain where places are located at different altitudes, it's not easy to draw up 2-dimensional maps. But I could finally solve the puzzle. Here is a map that I use extensively to uncover all the treasures in the hills. No discussion of Darjeeling is complete without a discussion on its Tea. After all this is what had originally placed Darjeeling into the world map. During my numerous trips, I have been to many tea gardens and estates in Darjeeling, seen the tea production processes, and had tasted tea at their outlets. Depending on the quality, Darjeeling Tea can range from Rs. 700/- a kg for regular black tea to well over 50,000/- a kg for white organic tea. I've been lucky to have seen even samples that broke the world record in tea pricing during a tea auction. And after you have explored this website and grabbed all my findings and experiences, I would like to say one thing though... wherever you are in the world, do pursue a visit to Darjeeling. It has all the greatest ingredients to make a perfect vacation. You will come back again. I have been coming back repeatedly since my childhood. Mark Twain said about Darjeeling: "The one land that all men desire to see, and having seen once by even a glimpse would not give that glimpse for the shows of the rest of the world combined". Well honestly, Darjeeling then and now are quite different, because time takes its toll. But if you come with passionate eyes and mind to look for the beauty, Darjeeling is still as amazing as it had always been. And after your visit, do share your Darjeeling Travel Reviews & Stories so that we all get to know about your own experience as well. Experience and findings are after all the pillars of this website. And do keep coming back to this website. I continue to post my latest findings and experience here. There are far more pages in this website than what you may imagine... scan through the top menu. Dear Sir, First of all thank you so much for making such a comprehensive and passionate blog about Darjeeling! This is a mine of information, it's amazing how much into every detail you like to go. Do you know anyone who is running a blog as informative as yours, for Sikkim State ? I hope so !! Thank you very much. Hello, I haven't seen much Sikkim information online other than the websites of Sikkim Tourism Department, travel agents and few stray bloggers. You can find some information about Sikkim from my website as well... Sikkim Tourism or Sikkim Permit Requirements could be a good place to start. Dear Mr. Bhattacharya, This is a short note to express my immense thankfulness to you and your website. I am an ardent admirer of the beauty of the hills around Darjeeling and whenever I plan a tour I visit your admirable website for the exhaustive information and helpful tips. Thank you so very much. Hello Raj, You deserve a standing ovation for this website. This is the best website on North Bengal tourism, even I think the govt. sponsored websites also are not accurate like yours. Thanks to Raj for his guidelines for Darjeeling tour. It was an amazing experience. Nature itself is enough to be in love with Darjeeling. Stay, food, shopping and site seeing are all convenient. I walked a bit and that was the best way to see Darjeeling. I wish transportation was a bit cheaper but again the climbing of hills miles after miles would cost some extra money. I just loved my Darjeeling Tour. I know you would have read plenty of lines about yourself from various tourists admiring your work, but seriously you have done a tremendous job. I see myself in your work because I'm a person who does his work with that perfection that no one can match. I'm sure that you are also of same kind. I've noticed that you have shared experience about smallest things also. This thing one can not find at any other platform. Whenever I plan for tour I always search various websites, similarly this time also I started to look into various websites but once I've seen your work I really haven't looked any other platform. Many many thanks and congratulations for your great work. Really appreciate it. Dear Raj, Thanks a lot for all your efforts in collating and sharing all the details along with the nitty gritties of places near Gangtok, Darjeeling and Shillong. I just came back from my trip and i must say without your valuable inputs I couldn't have planned my trip in solo. Appreciate all your efforts! Please keep it up. All the information you have provided are accurate and reliable. We simply followed all your instructions! Hello Raj, you have set up an absolutely wonderful website here. It is very comprehensive, clear to follow and is immensely helpful. No doubt it is a passion for you. It is good to see a fellowman create something of this exemplary standard. It's a wonderful experience travelling through Mirik to Darjeeling. Darjeeling Tourism site is the best I have ever come across. Every details of this site is true and descriptions are accurate and very tourist friendly. Before going to Darjeeling district everybody should carry a copy of details of the areas of their travel from Darjeeling Tourism. Dear Raj, Yours is one of the best and most comprehensive information on any tourist site. Such information in other places is being done by govt and its connected agencies, but here, not only that you provide valuable and in-depth information individually, you also provide regular feedback and answers to tourists' questions promptly! Great indeed. When I see such good work, I don't hesitate to praise! So thank you for your good effort. Dear Raj, I recently made a trip to Darjeeling. This was my most relaxed and comfortable trip, all thanks to your website. I have traveled across the world and generally do some research before starting my trip. I must say I have never come across an information source like this. Kudos to you man for creating such exhaustive and thorough travel guidance site. You must really be in love with Darjeeling. Best wishes for your future endeavors. This is not the first time that I had been on a planned trip... However I feel that none was and will ever be like this one. The reason - perfect planning and guidance. I would say that this site is an encyclopaedia for the entire trip... WOW..!! Understandably, there was only one reference guide for this trip and it was you (Raj) and your website. And thanks for your personal guidance too. The trip planning was going awry and by sheer luck I hit upon this site and then there was no looking further. Just back after an awesome trip to Gangtok - Darjeeling - Mirik and it was relaxed, refreshed and rejuvenated. And what else would one require. Dear Raj, I am among the very few Bengalis who hadn't visited Darjeeling. We now live in Portland, Oregon. Thanks to your greatly informative website, we had made plans to go visit Darjeeling when we were in India last year. Unfortunately, we had to come back from Dum Dum Airport dejected since the flight never took off for Bagdogra due to fog. Being on a tight schedule our entire plan fell apart. We finally made it to Darjeeling this November and sure enough, this one turned out to be one of our most memorable trips for multitude of reasons. Darjeeling, as I had imagined, had so much to offer - the natural beauty, the colonial past, the tea gardens, the local Tibetan culture and so much more. Being an addict of Darjeeling tea, I fancied myself as a kid in a candy store while in Darjeeling. And we were guided by your website at every step in our planning. Thank you so much for sharing such detailed Information through your website. It is a huge blessing for first timers like us. Dear Mr. Raj, Wanted to thank you for the lovely guide that you have created. So practical and useful. I was travelling with my little daughter, just followed your site and had wonderful time. Your information on taxis/ shared taxis/ routes and trains helped me to save and enjoy in the most economical manner. I followed your recommendation on hotels too, it turned out just perfect. Have already recommended it to my fellow travelers, and they were thrilled to have found something so useful. Thanks again. Greetings Mr. Bhattacharya. I am short of words as to how I may express my gratitude for the absolutely delightfully detailed description that you have provided through your blogs. Equipped with knowledge from your posts, I was able to plan my tour itineraries in Darjeeling and Gangtok, that I visited in the last week of December 2016. It was my first tryst with the grand Himalayas and I was overwhelmed. It would have been very inconvenient, had it not been for your online guidance. When I came back from my trip, I wrote short notes about individual places, posting them on my FB account - and trust me, my inspiration was your write-ups! May your elaborate descriptions and guidance keep inspiring fellow travelers from all around! We would like to convey our sincere thanks to Mr. Raj Bhattacharya for providing such a vast range of valuable information and guidelines in his website www.darjeeling-tourism.com. This has helped us a lot in planning our 7D and 6 N Darjeeling trip in November 2016. Because of his excellent guidance we had no hassle in choosing our hotel and tour operator, planning our itinerary, shopping etc. we had an excellent vacation in Darjeeling, enjoying the scenic beauty, interacting with the extremely cheerful and friendly locals, enjoying tasty food. We could avail good discounts at many places because of the Darjeeling Tourism Card which we purchased from Mr.Bhattacharya's website. We sincerely thank Mr.Raj Bhattacharya and everyone who have helped to make this a wonderful and memorable trip. Dear sir, first of all I like to thank you very much for your web site which is my base TO PLAN OUR TOUR. We are 4 male senior citizens & we travelled through Darjeeling & Sikkim from 17th to 22nd Oct 2016. Your guidance is fantastic to select mode of travel, place of stay & selection of sightseeing places within the available time, budget and personal taste. Your reply to my email regarding availability of taxi to Namchi drop from Darjeeling was helpful. On behalf of all my friends I once again thank you for your excellent guidance. Please keep up your work as I am sure there will be plenty of people benefited by your writings on the above subject. Hi Raj, I wanted to thank you for the amazing information that you have on this site. I traveled to India for the first time early this year, and your guides were instrumental in navigating Northeastern India. I stayed in Mirik, Darjeeling, and Gangtok, and made all of my travel choices based on your recommendations. I would recommend this site to anyone who's interested in going to Darjeeling and/or Sikkim. I'm coming back to the area again next year, and will definitely be using your site again! Thanks again for everything. You are doing an awesome Job. I have planned my entire trip at my own by browsing your website only :) Holiday package was costing me close to Rs 80,000 for 3 persons while I have planned it at my own for just Rs 35,000/- for 3 persons :) All thanks to you and your website for great information.